Thankfully I have found a few friends here at Augie that have the same passion for cooking as me. 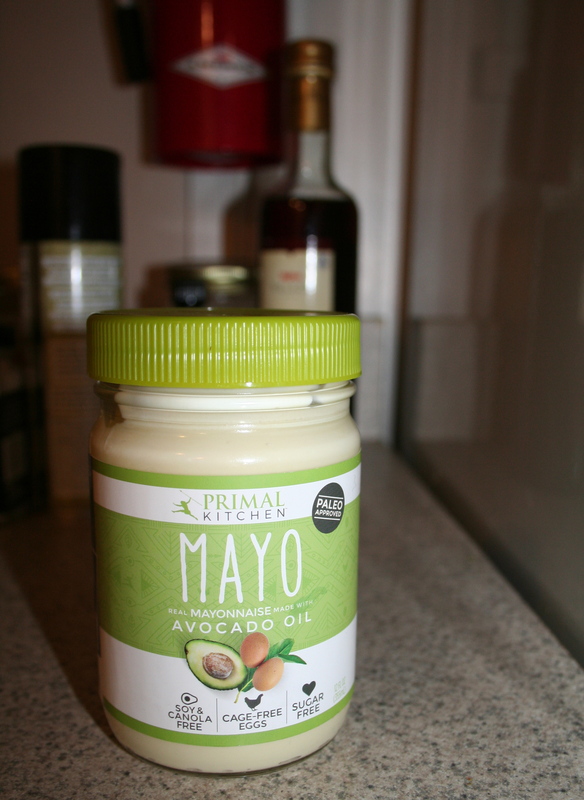 Two of my friends, Kayla and Caleb introduced me to Avocado Oil Mayo. In the stores this goes for about 10-12 dollars. Although I prefer quality, healthy products I also have a budget and would never have picked it up in stores unless my mom was in town. But, Thrive Market is an online health store that sells CHEAP health food products. For about $3.50 you can purchase a jar of this crack mayo. It has INCREDIBLE flavor and made with all natural ingredients. I love tuna but it definitely needs some mayo or sauce because of its dry texture. The contrast between the salty tuna salad and sweet potato made for a perfect lunch. Took about 5 minutes total to make as well. 2) Chop up carrots into thin circles, the onion into small minced pieces and the red peppers into small squares. 3) Remove tuna from the package and put in a bowl, add chopped veggies. 4) Mix in mayo, lemon and mustard. Make sure everything is coated. 5) Cut the sweet potato down the middle the hot dog way…….then make three to four cuts going the other direction. So you are left with a sweet potato that looks like your six pack abs. Use a fork and give it a good mash to create a little platform for your tuna salad to pile onto. Salt and Pepper and ENJOYYYYY!!!! Need something to munch on for a mid day snack when or to dunk in your coffee? It’s named muffin for a reason…..meaning you can eat it in the morning with breakfast. The dark chocolate cherry muffin will meet your needs I promise. Fluffy chocolate in my mouth! mhmmmm. 1) Mix all the dry ingredients together in a small bowl. 2) In a blender add all wet ingredients, blend. Slowly add in dry ingredients, blend until throughly mixed. 3) Pour batter into six greased muffin tins with liners if you prefer. 4) Bake for 12-15 minutes at 350 degrees. My oven is incredibly temperamental, so I am constantly checking, but just keep an eye on them. 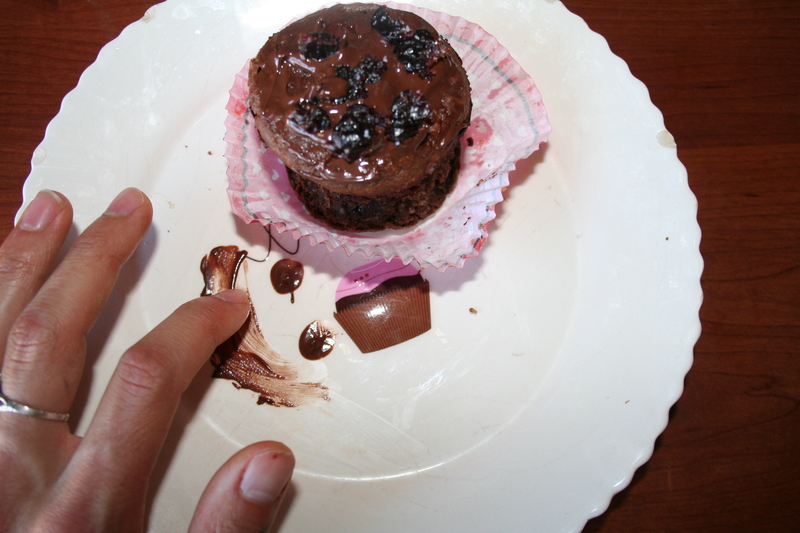 5) Let muffins cool for at least twenty minutes before putting on the chocolate sauce. Microwave the chocolate chips with coconut oil. Spread on top of each muffin and sprinkle a little bit of sea salt and chopped cherries. Although I love a good Thai chicken salad with a peanut dressing, I experimented and came up with a different recipe. 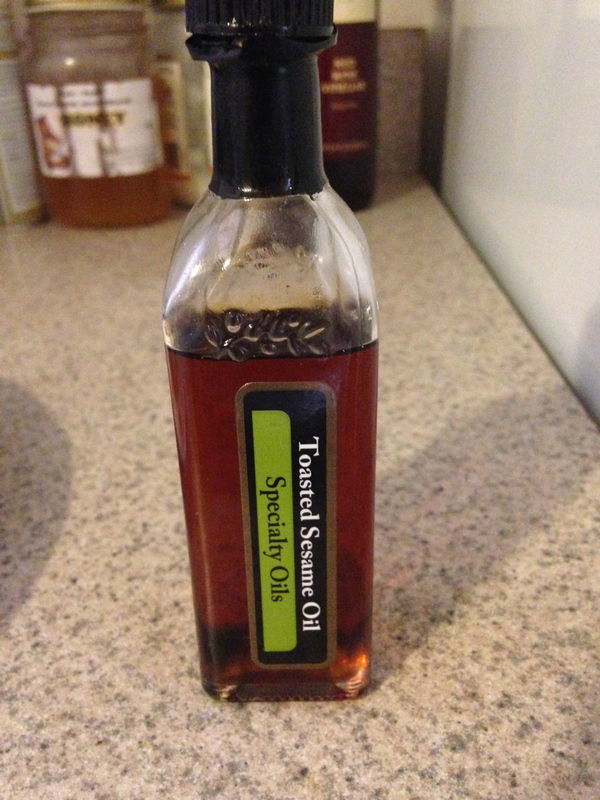 Sesame oil is must I believe for anything oriental and it pairs great with a honey ginger dressing. Top with some crushed nuts and it is a quick light lunch or side. My mom buys this for me at a olive oil store from home. There are many olive oil stores, even one in Sioux Falls. But mother doesn’t need to know that……take the free stuff while you can! 🙂 Toasted Sesame Oil is one of my favorites, but you only need a little, it is VERY strong. Recommend mixing it with regular olive oil or a balsamic dressing. Unfortunately I have a hard time actually measuring things out when it comes to dressings and sauces. But a relatively close estimate would be this! 1) Slice up chicken and fry up in a pan with olive oil and a dash of sesame oil for 4-5 minutes, then add chopped up onion and peas to the mixture. Stir fry together for another 3 minutes until throughly cooked and browned up a bit. 2) Mix together the ingredients for the dressing. The honey can be hard to incorporate, so microwaving it for 5 or 6 seconds can help if necessary. Successfully made my first pork tenderloin in the oven yesterday, however it was three pounds so leftovers meant BBQ pulled pork. I’m a big fan of Annie’s brand Mac n Cheese but made my own and topped it was sautéed veggies. Then in a blink of an eye twas gone! 1) Prep a pot with water for boiling the noodles. While the noodles are cooking, slice up broccoli and onions. 4) Once the noodles are done (about 8-10 min), Drain water, add milk, cheese and butter. 5)Assemble. 1st- Layer of Mac 2nd- the Meat and Veggie mixture 3rd- more BBQ sauce, salt and pepper. Enjoy! Whenever I go out to eat with my sister, if there is a cranberry turkey sandwich wrap, sandwich or salad she orders it in a flash. Therefore, I created this recipe to give her some variation but still keep the same sweet and savory combo that she loves. This sandwich can be served hot or cold or throw in noodles instead of bread to make it a pasta salad. Many twists and alterations to be made but for me a simple sandwich is what hit the spot. Note: it is a proven fact that sandwiches taste better when cut diagonally. Don’t go down the middle. Poor life choices. Rotisserie Chicken Breast (Or cook a regular chicken breast will work) —I use Rotisserie because it is much easier to shred for sandwiches. 1) Shred Rotisserie chicken breast to desired amount. 2) Mix in mayo and mustard. Chop up jalapeño, dried cranberries and cheese into small pieces. Add to chicken mixture. Chill in the fridge for at least thirty minutes. Or if you prefer it warm, microwave all ingredients for a bit. Cold is the way I have tried and prefer but experiment around! 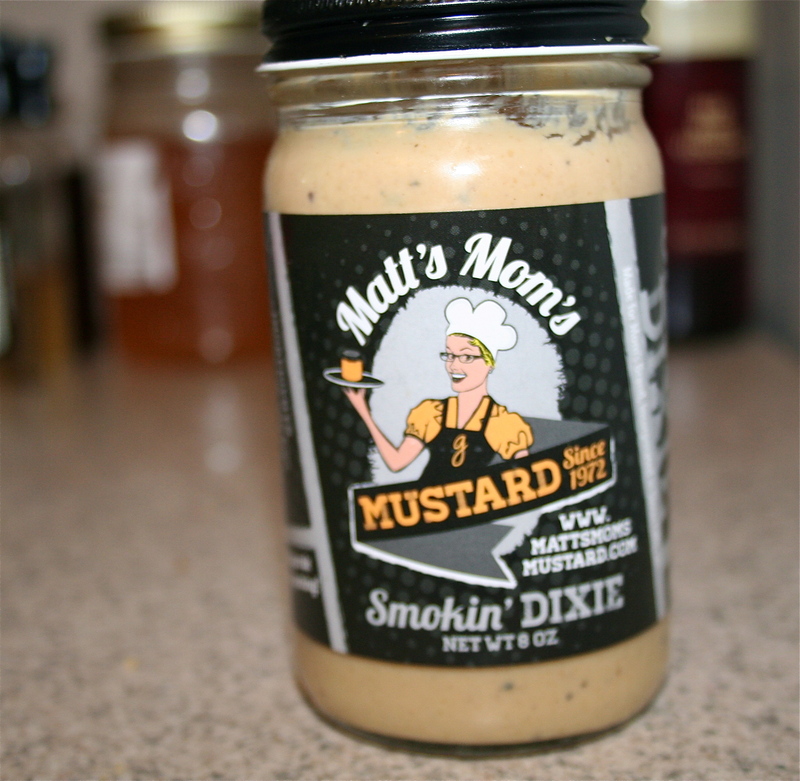 3) slap it all on a sandwich and enjoy. Favorite fast food restaurant hands down is Chipotle. Delicious guac and tacos are my go to. However, being gluten free now, it means corn tortillas instead of flour. Although I don’t mind corn tortillas they tend to be dry and crack easily, especially when they are loaded with meat and salsa. I love sweet potatoes so I whipped up these sweet potato type tortillas, threw the batter in a pan and flipped em like a pancake. More flavor and texture than the corn tortilla. 2) The hard part now, throw all the ingredients in for the tortillas into a blender. Blend until smooth. The batter should be thick but should be thin enough that you can spread it around in the pan. If it seems to thick add one more egg. 3) Heat up a pan and throughly grease the pan. Add the batter to desired tortilla size and fry up for about 2-3 minutes on each side. 4) fill your tortilla with chopped up roma tomato, lettuce, hamburger, salsa and guac. ENJOY!!!! Quick and easy side dish or bump it up with some eggs to make an ideal breakfast. Easy ingredients and delicious flavor. 1. First get the risotto cooking. I like to cook mine in chicken broth versus water to add more flavor. 2. While that is going chop up mushrooms, white onion and sausage. The sausage is already precooked which is a huge time saver and makes things WAY easier. Raw sausage with skin weirds me out. 3. Throw in the chopped veggies and sausage into the risotto after its fluffy and fully cooked. Let simmer together with 1 tbs olive oil (I have my garlic infused kind) and stir fry together. I topped mine with an egg and had it for breakfast but that’s just me! I love egg salad, potato salad and chicken salad. So I though why not mash two of them together. Typically I love chicken salad with a little nut and apple action. But pairing the chicken with egg made me lead to the more savory side of things. The ingredients are simple and it can be enjoyed on a sandwich, salad, chips or brown rice noodles. 1) Hard boil eggs. The trick I learned from my mom is to fill the pot so eggs are covered and turn to medium/high heat for 12 minutes. (start to finish 12 minutes, so start your timer as soon as you turn on the stove, not when they start boiling) After timer goes off run under ice cold water so they stop cooking. For the chicken, dice up and cook in coconut oil or preferred cooking/baking or grilled method. Refrigerate eggs and chicken for at least 2 hours. 2) Peel eggs. Easier said then done …right? Trick I learned is to fill water glass half way full and plop egg in there. Cover the top of the cup with your hand and vigoursly shake around for about 15 seconds. Take out the egg and peel, hopefully in one piece instead of a thousand micro pieces. Dice up eggs and throw in a medium sized bowl. 3) chop up chicken, celery and onion. Add to the eggs. 4) In a small bowl mix together the vinegar, mayo and dijon mustard. 5) Throughly mix sauce onto other ingredients. Dust some pepper and salt on top. Enjoy! Almond Lemon Poppyseed Love Muffs! Lately I have been trying to perfect baking muffins and breads with coconut flour ….unsuccessfully. Coconut flour tends to leave things dry and DENSE from my experience. Therefore, I switched to almond flour and gluten free baking flour (brown rice and tapioca flour blend) as a better alternative. These muffins turned out fluffy and rich with flavor instead of the bricks I’ve been making with coconut flour. 1. Put all dry ingredients together, mix throughly then set aside. 3. Stir in dry ingredients slowly until throughly mixed. Grease muffin tin and fill about 3/4 full. Bake at 350 for about 12-15 minutes. Top with a little honey and lemon zest! 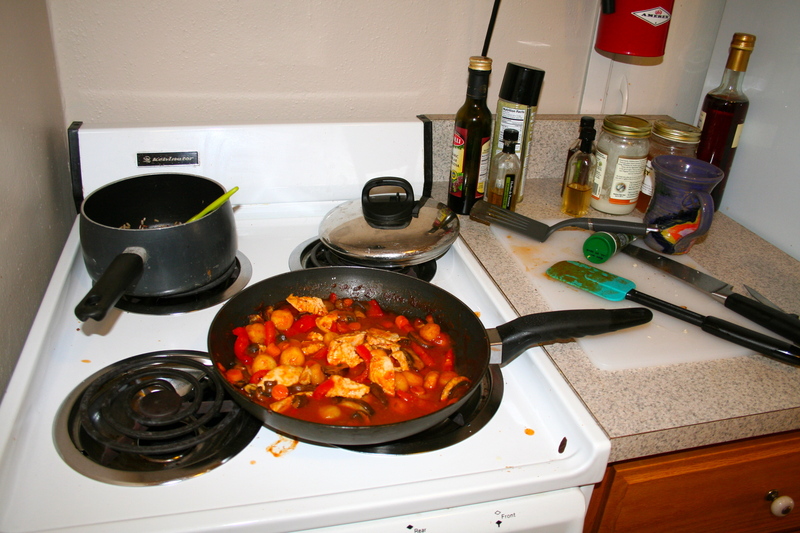 I first tried coconut curry when my sister and I went on a little trip together to Duluth. We decided to splurge a bit and go out for fancy dinner. Stepping out of my comfort zone we both ordered dishes we had never tried before. The meal was better than bananas, peanut butter and chocolate…..and that is saying ALOT!!! It was loaded with mushrooms, peppers, carrots, onions and chicken and the sauce was perfect. I have attempted many times to recreate it and I think I found something that almost compares. A little zing, sweetness and spice all in one dish. 1) First I started by throwing my chicken breast in the oven at 350 for 20 minutes. Pan frying would work as well, however I have limited cooking supplies and stovetop space so oven it was for me! Next prep your rice. My jasmine rice takes about 30 minutes in all. I use chicken broth and lime juice instead of water to cook to add extra flavor! 3) Now time for the sauce. When you first open the coconut milk it will be separated. Don’t freight! That is how it is suppose to be. Give it a good stir and it will melt just perfectly when we add it in the sauce pan. In a large mixing bowl add the coconut milk, red curry paste, tomato paste, onion powered, ginger powder, red pepper flakes and honey. Use a whisk and stir all ingredients together. Transfer into a sauce pan and simmer for 10-15 minutes. Stir. 4) After 15 min add your veggies. Let simmer and cover for another 10 minutes. I added 1 tsp of arrowroot powder to thick in up a bit. You can use cornstarch or a bit of flour to thicken. 5) Once chicken is done. Let cool for 5 minutes to keep the juices, then cut into thin slices. 6) Throw chicken in with sauce. 7) Lastly assemble, lay a bed of rice then top with a your chicken curry mixture. Top with fresh cilantro, salt, squirt of lime juice or coconut flakes!